Is it possible to move a bone from one armature using the movement of other bone in another armature? This is very much possible and quite easy. Just add a Copy Location or Copy Rotation or Copy Scale or Copy Transform constraint (depends on how you want the bone to move) on the bone you want to be moved, you must be in pose mode for this. Go into the bone constraints tab or press shift+alt+c with the bone selected and choose the constraint afterwards. 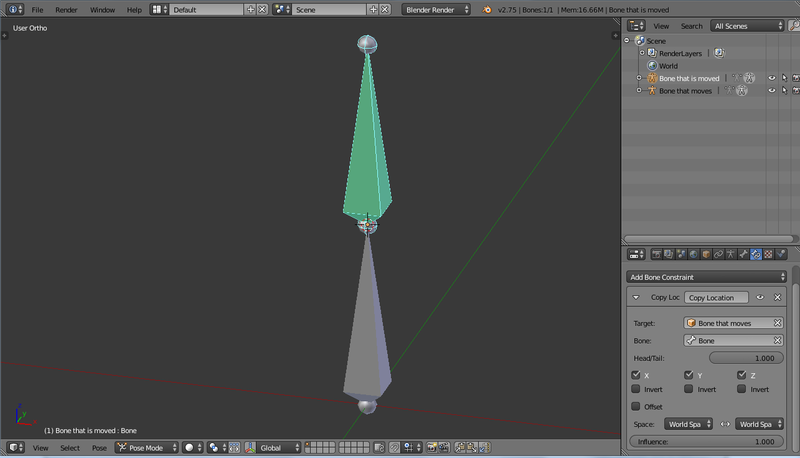 In the Constraint settings choose the armature of the moving bone and the moving bone as target. Depending on where you want the moved bone to be, you should set the head/tail value of the constraint. Now you can move the moving bone and the moved bone will follow. Not the answer you're looking for? Browse other questions tagged animation armature bones or ask your own question. Moving a bone within weighted mesh? Workflow for animating a linked armature with bone constraints? Armature: bone rotating other bones when moved!